No stranger to doing something no one before her had ever done, Susan O'Hara-Bates, founder, past board president and currently The Groom Elite Program’s Secretary-Treasurer will attempt something no other woman has completed in its entirety when she sets out on May 1 to ride the 2,650 mile Pacific Crest Trail from Mexico to Canada. The trek starts near Lake Moreno in California the first of May and ends 5.5 months later 30 miles past Hart’s Pass, Washington, some 6,800 feet above sea level. The Pacific Crest Trail is a hiking and equestrian trail that zig zags through California, Oregon and Washington traversing deserts, mountain ranges, volcanic rocks and pristine, remote in which there are sometimes more than 150 miles between maintained roadways. Only a Canadian wilderness packer in 1988 and a retired veterinarian in 1992 are known to have completed the border to border ride in one season since the PCT was designated a National Scenic Trail in 1968. In 2004 a couple took three pack horses with them as they hiked the complete distance. O’hara-Bates is attempting to be the first “thru-equestrian” since 1992 and first woman to ever complete the trail on horseback. The challenging trail goes as low as 200 feet above sea level and climbs as high as 13,000 feet through the Sierra Mountains. Desert heat, thin air and volcanic rock that can cut and bruise feet are some of the physical obstacles horse and rider must face. With an expected ending date of October 12th, O’Hara-Bates will be hoping an early snow does not block Hart’s pass as has happened previously in early October. Mrs. O’Hara-Bates’ primary mount will be Four N Port, a Thoroughbred bred at her Navasota, Texas based Woodswitch Farms. The 10-year old gelding by Porta Varas out of Runner’s Chill by Big Chill was a “Delta Downs reject” according to his owner/rider. But with stamina in his pedigree (Sea Bird is in his sire line and his mother is out of a daughter of Secretariat’s half brother First Family) he has become a respected trail horse. His “understudy” Issy, (Is A Fire by Fire Maker out of Isla Carroll by Danotable) another Woodswitch homebred, was so “laid back” when he was racing that his exercise riders thought he was the stable pony. Both former racehorses have been undergoing intense conditioning as they prepare for the “ride of their lives”. The Elite Program, via its website (www.groomelite.com) will be the link between O’Hara-Bates and her supporters. A special page on the Groom Elite website will enable horse lovers to pledge their support and make contributions through a Pay Pal link. 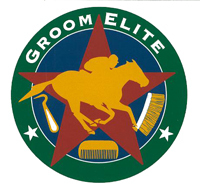 ALL proceeds donated through the website will go to The Groom Elite’s education programs. Mrs. O’Hara-Bates will be wearing a GPS tracking device “Spot” so that supporters can keep up with her progress on Google Earth. Regular updates will be posted when the trail team camps in an area with internet access. For more information contact Mrs. O’Hara-Bates at Woodswitch@hughes.net or through the contact page at www.groomelite.com. The PCT spans 2,650 miles from Mexico to Canada through three western states: California, Oregon and Washington. Thousands of hikers and equestrians enjoy the PCT each year. Some only travel a few miles, while others complete every mile in a single season! As America's westernmost National Scenic Trail the PCT reveals the West's unique blend of environs and beauty including the rugged high desert, glaciated expanses of the Sierra Nevada, and volcanic peaks and glaciers in the Cascade Range.